UW researchers are trying to understand more about crows’ brains and behavior, specifically what they do when the birds see one of their own die. They react loudly to the dead, but the reasons aren’t known. 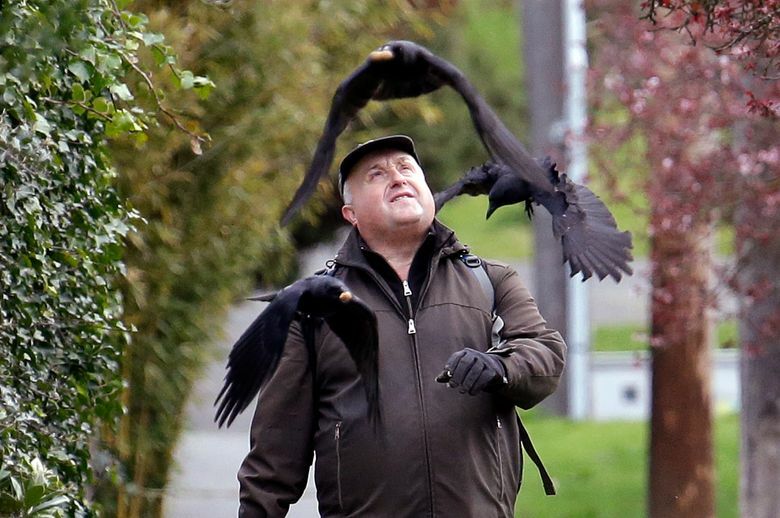 For nearly every step of his almost-12-mile walk in Seattle, Darryl Dyer has company. Flocks of crows follow him, signaling one another, because they all know that he’s the guy with the peanuts. Scientists for years have known that crows have great memories, that they can recognize a human face and behavior, and can pass that information on to their offspring. Nowadays, researchers are trying to understand more about crows’ brains and behavior, specifically what the birds do when they see one of their own die. They react loudly to the dead, but the reasons aren’t entirely known. Among the guesses is that they are mourning; given that crows mate for life, losing a partner could be a significant moment for the social animals. There are anecdotes of crows placing sticks and other objects on dead birds — a funeral of sorts. Using masks that look creepily human, researchers showed up at Seattle parks carrying a stuffed crow. They recorded the reactions. It takes one crow to signal an alarm, and then dozens show up. They all surround the dead crow, looking at it as they perch on trees or fly above it, a behavior called mobbing. 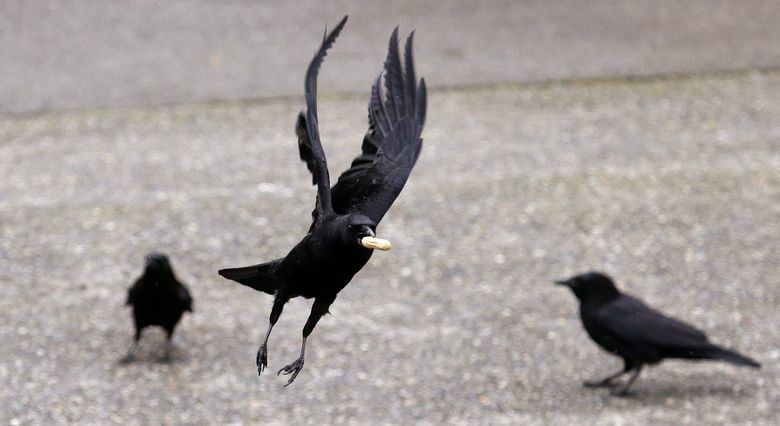 “Crows have evolved to have these complex social relationships, and they have a big brain,” said Kaeli Swift, a University of Washington graduate student who led the study. How big a brain? Crows are on par with smart mammals, like dolphins and primates, in brain-to-body proportion. They have been known to be problem solvers and are among the few animals recorded to use tools. In another part of the experiment, using slightly radioactive tracers, researchers measured the brain activity of crows after they were shown a dead bird. The scans showed a section of the hippocampus — the part involved in memory formation — lighting up at the sight of death. “In that particular situation at least, that crow was learning about a place, or a face, or a situation and associated it with that dead crow,” said John Marzluff, the lead researcher. 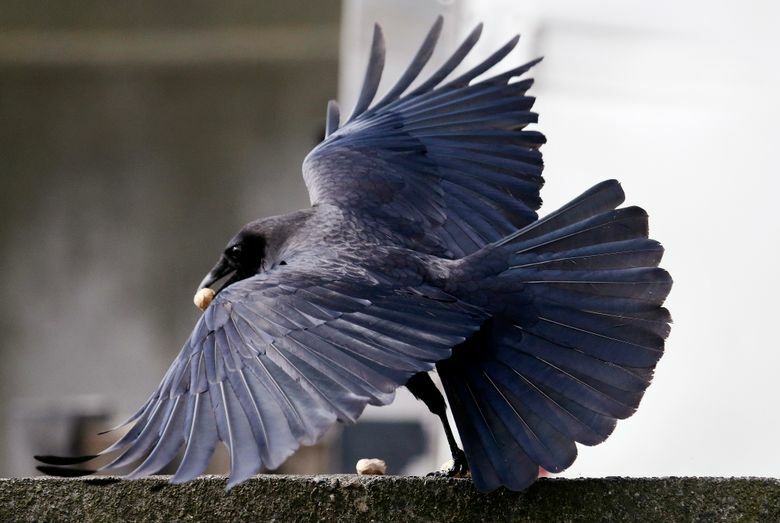 To Marzluff, this study and upcoming research on crows highlight a special relationship humans have with a bird that has thrived in its cities and civilization. “When you see its brain is using the same parts of the brain to remember things that we do, or to learn fearful situations like we do, maybe it gives you a little more sympathy to the bird, or maybe kinship with the bird,” he said.